Do you ever get tired of drinking the same smoothies day in and day out and feel like you are suffering from smoothie fatigue? I find that many of my clients think smoothies are a great idea because they are loaded with protein to control cravings and low on the glycemic index if you pick the right protein powder. They are also easy to make and easy on the digestive system. I also love them because you can add a lot of nutrients that help to balance hormones such as fiber either with chia seeds or ground flax seeds and nutrients that support the liver such as herbs like parsley as well as dark green leafy vegetables. So why do we stop drinking them? I think it is because we make the same recipes over and over again. And get flavor fatigue. So, let’s change it up and make it more seasonal and fun. I don’t know about you, but I always start craving pumpkin pie spice around this time of year. And because I eat to balance my hormones, I really don’t want to turn to a Pumpkin Spice Latte. Too much caffeine, sugar and dairy. Because I follow a gluten free and mostly dairy free diet, I used to feel like I was left out of the autumn holiday fun because flavors like ginger, cranberry, and chai felt like they were beyond my reach. Here are some recipes that help me enjoy this pre-Thanksgiving time. I hope you like them too! CLICK HERE to download a printable PDF file with all 3 recipes. Ginger is a great fall spice. I add a drop of doTerra ginger or a thumbnail sized piece of fresh ginger to many of my smoothies. It makes it taste so fresh! Tip: You can always freeze ginger to keep it fresh. Chai is a great fall flavor too. Put all ingredients in blender. Blend on high. Sprinkle top of smoothie with cacao nibs. Mix all ingredients in a small bowl. Store in air-tight container for up to 3 months. If you have a great fall smoothie recipe that you want to share, I would love to hear from you. I hope you are having a fabulous fall. 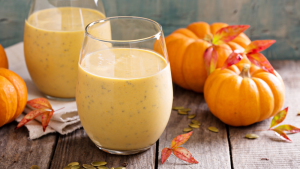 I like the Pumpkin Smoothie the best! But then, pumpkin pie is my favorite too! Please stay in touch and let me know how you are doing!